Eight weeks later Michael Kimmelman, architecture critic for The New York Times, took a sledgehammer to the CLP, reminding the NYPL’s leaders that “the last thing they’d want to be remembered for is trashing their landmark building and digging a money pit,” and urging them to unleash their architect, Norman Foster, on the tumbledown building across the street, the Mid-Manhattan Library, which the NYPL is determined to sell for approximately $100 million [see Sherman, “Upheaval at the New York Public Library,” December 19, 2011]. Those impassioned arguments were not enough to derail the CLP, the cost of which could reach as high as $350 million. But those funds would be more wisely spent on the NYPL’s eighty-seven branch libraries in Manhattan, the Bronx and Staten Island, which need approximately $800 million in renovations, including elevator rehabilitation; new roofs, boilers and windows; and fire alarms. At a recent City Council hearing, NYPL president Anthony Marx declared that some of those branch libraries are “shocking…an insult to the citizens of New York.” A few hours after Kimmelman’s article appeared in print, Marx championed the CLP in an interview with WNYC radio, during which he reiterated the very claims the two critics had already demolished. 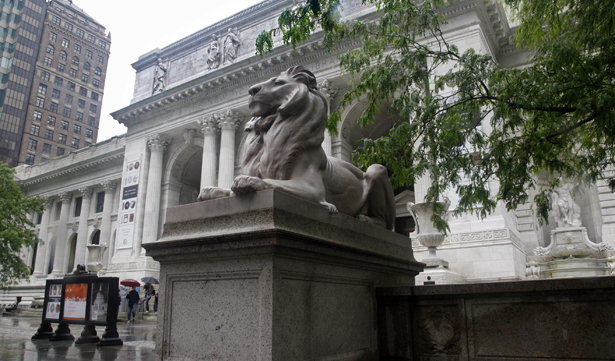 The NYPL is not the only New York City library under criticism. In January, the Brooklyn Public Library (which is separate from the NYPL) revealed that in the wake of diminishing financial support from the city, it intends to sell two branch libraries to real estate developers: a 1962 building in upscale Brooklyn Heights (for which the BPL could get up to $100 million) and a sturdy Beaux-Arts building in a gentrifying section of downtown Brooklyn, constructed in 1904. A SignOn.org petition—directed at the BPL and the NYPL and lamenting the “shrinking [of] our library system to create real estate deals for the wealthy”—has been signed by more than 9,000 people. NYPL to provide, before any contracts are signed, a “clear and open accounting of both its plan and some alternatives,” as well as a “detailed cost analysis by at least one independent party.” We are still waiting for all those things; the fact that much of the CLP ($150 million) will be paid for by taxpayers adds urgency to Kimmelman’s demand. Public libraries are not oil companies or banks; they exist to disseminate information, and it’s disheartening to see the world-class NYPL hoarding data that belong in public hands. View Scott Sherman’s previous articles on the NYPL here and here.